Listen, I’m gonna let you in on a little secret. Little bit of “insider industry knowledge,” if you will. The Jaguar F-Type, while delightful, has V8 variants that are simply too much. The 550 horsepower F-Type R is overkill, and the 575 HP F-Type SVR is extra overkill. The supercharged V6 F-Types are the sweet spot, but a new base model four-cylinder version unveiled today is even more of a bargain. In short, it has 296 HP, starts at $59,900, and looks like a Jaguar F-Type, because it is a Jaguar F-Type. The only problem, so to speak, is that the V6 versions start at only a few grand extra, so while this is compelling you may want to splurge for more power. 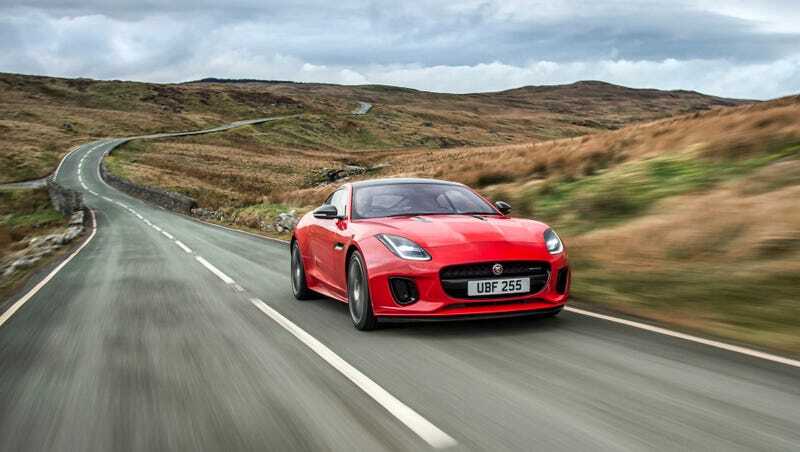 Jaguar debuted this new base model F-Type at the New York Auto Show today, and it means their sports car now has one of the broadest ranges around, from this humble but powerful engine all the way to the screaming SVR. The new four-cylinder engine, part of the “Ingenium” family of motors that are also in the XE sedan and various Land Rovers, allows the F-Type to scoot from zero to 60 miles per hour in 5.4 seconds and hit a top speed of 155 mph. It comes in both roadster and coupe form, but! Very curiously, unlike the V6 version, a manual is not available; it only comes with an eight-speed automatic gearbox. I’m still holding out for the day I can get a base, manual, four-cylinder F-Type, ideally with cloth seats and a price tag around $26,000, but that will never happen so this is the next best thing. Updated with additional pricing information.